There is a lot of false information regarding bankruptcy. Here is a list of the most common myths we’ve encountered. Please consult with reputable Miami bankruptcy attorneys before deciding bankruptcy is not a viable option for you. 1. My employer will find out and fire me, or my potential future employer will not hire me because I filed for bankruptcy. Discrimination solely because you filed for bankruptcy is prohibited under the U.S. Bankruptcy Code. 2. I have to be broke or behind on my bills to file bankruptcy. No. Do not wait until you’ve drained out your savings, or 401(K), or borrowed more money from relatives and friends. Consult with a Miami bankruptcy attorney right away if you do not see a way out of your current financial situation. 3. Bankruptcy is not affordable. Most bankruptcy attorneys have payment plans. In general, you will be advised to stop all credit card payments, which will free up money for fees. In Chapter 13, most of the fees are paid through the plan payments. 4. I will lose my home. In Chapter 7, as long as you are current on your payments, you can keep your home. In Florida, there is a homestead exemption which may assist you. 5. My credit is destroyed forever. Bankruptcy is reported on your credit report for 10 years. This does not mean you cannot get credit for 10 years. Chances are you already have bad credit. Most credit scores will go up after filing bankruptcy, usually do to the debt-to-income ratio improving. 6. I will never get a home, an apartment or car. People do rebuild their credit after bankruptcy and go on to buy homes and/or cars. Your credit score may actually increase after bankruptcy, especially since bankruptcy will have a positive effect on your debt-to-income ratio. 7. You can’t go bankrupt anymore since the new law. The 2005 Reform Act made it more difficult to file for bankruptcy, but it is still possible in most of the cases. Consult with a Miami Bankruptcy Lawyer to determine if you qualify. 8. The new law says you have to pay everything back. In Chapter 7 bankruptcy, debts are wiped out with the exception of certain taxes, child support/alimony and student loans. 9. It will be in the newspaper. No. Your bankruptcy filing will not be publically displayed or announced in a publication. However, it is public information, and anyone that wants to can go to the Bankruptcy Court and request your file. Additionally, the information is available on a Federal Bankruptcy database but to access it, you must have an account. 10. I hear “you can’t go bankruptcy on credit cards any more”. Not true. Credit cards are unsecured debts and will generally be discharged by bankruptcy. 11. After you take a credit counseling course you must wait 6 months before you can file a bankruptcy. Credit counseling must be completed within 6 months of filing bankruptcy. Check with the US Trustee’s Website for authorized Credit Counseling courses. There is no waiting requirement after completing credit counseling to file for bankruptcy. 12. If I file for bankruptcy I’m a failure. Plenty of famous and successful people have filed for bankruptcy. Ask yourself, can I be more productive and successful if I did not have this debt? 13. There’s a secret way to make your creditors accept a fraction of the debt. It is true that oftentimes credit card companies will offer to settle on stale debts. However, creditors may (and often do) sue you. Unless you have a valid defense for the lawsuit, you will most likely lose the case. They can get a judgment against you and garnish your wages or put a lien on your property. Assuming they do settle, what the creditors and debt settlement companies don’t tell you is this: the amount forgiven will be considered income to you and you will be taxed on the amount forgiven. It’s better to owe your credit card money than the IRS because you can discharge the credit card debt in bankruptcy much more easily! 14. I’ve hired a debt settlement firm to help me pay off all of my debts at a deep discount in 3 years or less and now I won’t have to file for bankruptcy. See #14. Debt settlement firms aren’t lawyers. There is nothing they will or can do for you should your creditors decide to sue you. Additionally, creditors do not have to settle with you at all! Most of the time, the debt settlement companies will keep most of the money for themselves, leaving little for the actual settlement. They can’t do anything for you that you can’t already do for yourself – not pay your creditors then work out a settlement. If you do decide to hire a debt settlement company, please be sure to check with the Attorney General office of the state the company is located. There are lots of warnings issued by governmental agencies regarding the dangers of hiring a debt settlement companies. 15. My friend told me as long as I am going bankrupt I might as well max out my credit cards and use up what is left. 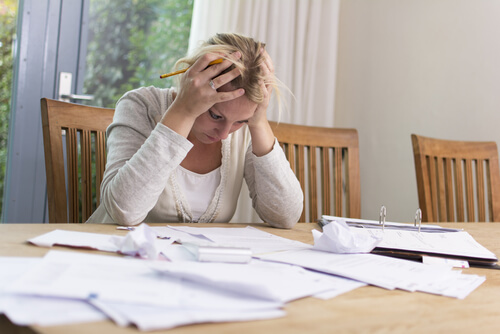 Accumulating debt with an anticipation of filing for bankruptcy may be considered fraud. Bankruptcy is for the unfortunate but honest debtor. 16. I should “leave one card out” of the bankruptcy. ALL debts must be listed on the bankruptcy petition. Everyone you owe money to must be listed. This includes friends and families. See #5. Ask yourself, what will it take for me to get out of debt? Most people continue to make the minimum payments not realizing the amount of money it will actually take to get out of debt. Do not make the mistake of getting trapped in the cycle of making minimum payments – never being able to live debt free. After filing for bankruptcy, your debt-to-income ratio improves. This will help your credit score. Additionally, you cannot file again for 8 years (in case of Chapter 7) so you’re actually a “safe bet” for the creditors. 19. Bankruptcy does not apply to certain creditors like Bank of America. Bankruptcy applies to Bank of America as well as all other banks. Generally, all unsecured debt will be discharged in a Chapter7. In Chapter 13, the amount you pay back will depend on your payment plan. Have additional questions? Call a Miami bankruptcy lawyer today at (305) 817-3677. Visit our website at www.andresmontejolaw.com. Miami Bankruptcy Lawyer | Call us at (305) 817-3677 or email us at info@andresmontejolaw.com.